All our products are available for purchase from our online shop. Channel’s Norfolk Preserves was started in 1990 with one product and has grown over the years; currently, we have 40 products in the range, and are always looking to add more. We are a small family-run company based on the East coast of England. All of our products are made in small batches ensuring excellent quality control. All our jams and marmalades are made with only three ingredients: FRUIT, SUGAR and PECTIN. No artificial colours or chemical preservatives are used. We supply local farm shops and delicatessens throughout Norfolk and Suffolk. (SEE LOCAL STOCKISTS.) Please check with the shop before calling as not all shops stock all items. 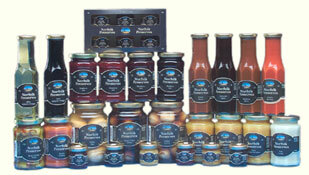 Are you looking for a high quality range of pickles, sauces, chutneys and preserves for your customers? Norfolk Preserves is a manufacturer of a wide range of high quality products ideal to be sold for consumption or as gifts. All sauces and preserves are made with high fruit content, meaning they are more flavourful than other brands. All jams and marmalades contain only three ingredients – fruit, sugar and pectin (with the exception of the marmalades that also contain alcohol). All jams and marmalades contain at least 25% less sugar than high street brands, and as a result are a healthier option. All products have been designed with the passion of the owner, David Channell. The entire range of 46 products are attractively packaged and look impressive as a retail range. The low production batch size means that the shelf life available is significantly longer than High Street brands. Contact David on 01493 330168 to arrange a meeting at a venue of your choice to discuss your requirements. We look forward to hearing from you.